President Donald Trump delivers his State of the Union address to a joint session of Congress on Capitol Hill in Washington, as Vice President Mike Pence and Speaker of the House Nancy Pelosi, D-Calif., watch, Feb. 5, 2019. 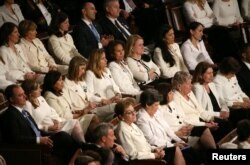 Members of U.S. President Donald Trump's family sit in attendance as he delivers his second State of the Union address to a joint session of the U.S. Congress in the House Chamber of the U.S. Capitol in Washington, Feb. 5, 2019. ปธน.ทรัมป์ กล่าวว่า "อเมริกาคือประเทศที่เศรษฐกิจขยายตัวอย่างร้อนแรงที่สุดในขณะนี้ ทิ้งห่างประเทศอื่นๆ ไปไกล"
Democratic women of the U.S. House of Representatives listen to President Donald Trump's second State of the Union address to a joint session of the U.S. Congress in the House Chamber of the U.S. Capitol in Washington, Feb. 5, 2019. 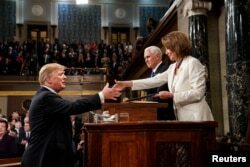 President Donald Trump, before delivering the State of the Union address, shakes the hand of Speaker of the House Nancy Pelosi. Vice President Mike Pence, center, is also in attendance at the Capitol in Washington, February 5, 2019.